Do you like playing cards? Even if you don’t, chances are you might still want to challenge yourself with a bunch of card tricks. 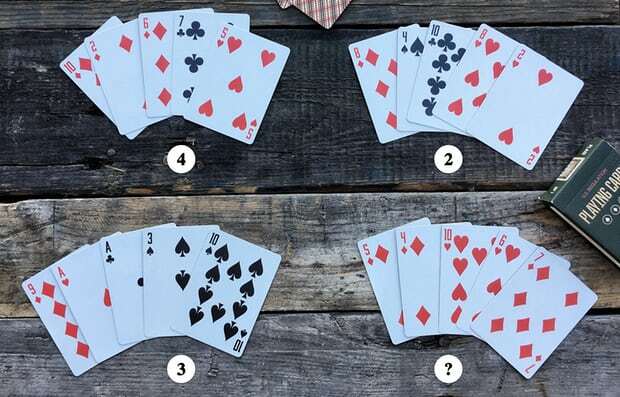 Today, we’re offering you three card problems to see if you can spot the patterns in a set of playing cards. Let’s start! 1. Complete the pattern by replacing the face down card in the top row with one the face up cards in the bottom row. 2. Choose one card in the deck to replace the face down card in order to complete the set. 3. Choose the number to replace the question mark in order to complete the pattern. These card playing tasks have been brought to you by Adam Rubin, the Director of Puzzles and Games for Art of Play. Please mind, the solutions to the puzzles rely mainly on a flash of insight. The tasks come in order of increasing complexity, so the third one can feel like the most difficult one. So, are you ready to know the correct answers? Solution: The Jack of Spades. 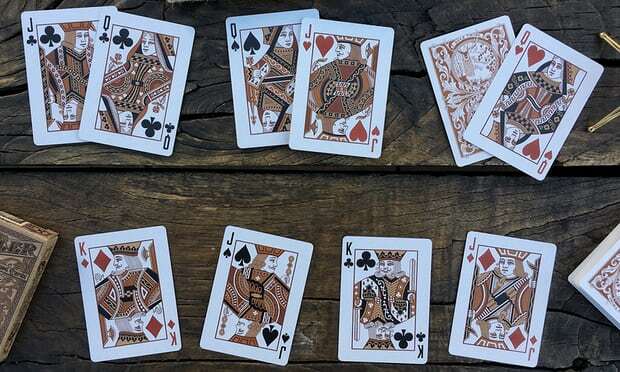 The Jack of Spades’ face is looking rightwards, but all the cards in the top row are all looking at each other. Solution: The ten of clubs. First of all, the suit has to be clubs, because all the cards are clubs. Then, as for the value of the card, don’t be thinking numerically, this is heading in the wrong direction. The trick is to be reading the card values in your head: the visible cards are the ACE, the SIX, and the TWO. So, the only other card with a three letter value left is the TEN. The key to finding the right answer is literally spinning the cards by 180 degrees. According to the author of the puzzle, “the numbers refer to the number of symbols that are out of position when you spin the cards by 180 degrees.” If you take TWO of hearts, and rotate it by 180 degrees, it would still look the same as it used to before the rotation. However, when you spin the FIVE of hearts, the heart in the middle won’t be perfectly overlapping where it was before. In the top left corner of the picture: there are four symbols that are out of position after a 180 degree spin. These cards are as follows: the heart in the FIVE of hearts, and three of the clubs in the SEVEN of clubs. In the top right corner of the picture: the two hearts on the middle of the sides of the EIGHT of hearts. 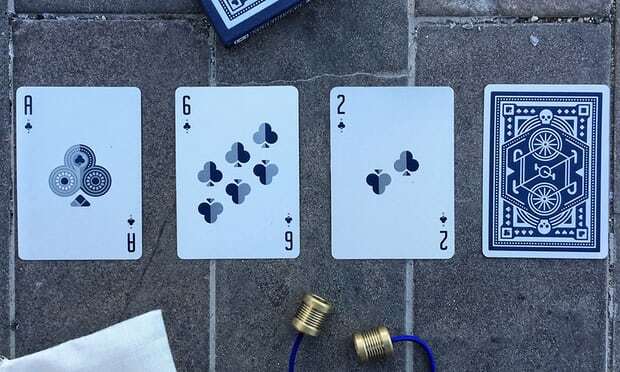 In the bottom left corner of the picture: the symbols in the two aces, and the middle symbol in the THREE of spades. In the bottom right corner of the picture: the diamond in the middle of the bottom half of the SEVEN of diamonds, and the two hearts in the SIX of hearts.